Why hike to Glen Aulin? To see the picturesque effects produced by a manic-depressive river. For three miles, the Tuolumne River curves lazily through meadows like a time-lapse video of a cat on a sunny windowsill. Then it perks up and dashes over a series of cascades and waterfalls, terminating at Glen Aulin - envision, if you're enjoying the metaphor, the same cat as you try to herd it into a cage to take to the vet to have some highly private bits snipped off. Below Glen Aulin, if you go that far (and even if you don't, for that matter), it becomes even more sedate than it was at the top of the trail - under anesthetic, perhaps. Then it rouses again for a raucous trio of waterfalls and the descent into the Grand Canyon of the Tuolumne - not unlike a cat that's just conducted a self-exam and realized exactly what you've done to it. Difficulty: 7 out of 10, let's say. Besides the distance and the starting elevation, most of the elevation change is packed into the half of the hike closest to Glen Aulin, so you notice it more, and much of that stretch is rocky as well, requiring you to slow down to pick your way through the riprap. Crowd Factor: It's a busy trail, for a variety of reasons: it starts at Tuolumne Meadows, the unofficial headquarters of the Tioga Road area; there's a High Sierra Camp and backpackers' campground at the hike's turnaround point; the trail is the gateway to the Grand Canyon of the Tuolumne; it's part of the Pacific Crest Trail; and of course, it's a very pretty hike. Best time to visit: It's worthwhile any time the trail is open. The waterfalls will be more spectacular the earlier you go. Since they're fed by a river (the Tuolumne) rather than the mere creeks that furnish Yosemite and Bridalveil Falls, though, there should still be enough water to satisfy your eyes even late in the season, and the pool below White Cascade makes a great swimming hole in late July and August. Nearest Bathrooms: If you're starting from the Dog Lake/Lembert Dome trailhead, you'll find hole-in-the-ground bathrooms there. There are bathrooms with plumbing at several spots along the southern shore of Tuolumne Meadows, including at the visitor center, the grill, and the sporting goods store. Once you're underway, you'll find more pit-style bathrooms outside Parsons Lodge (where the trail departs Tuolumne Meadows for Glen Aulin) and at the Glen Aulin backpackers' camp. There are bathrooms with plumbing at the High Sierra Camp, though they're for guests only. Nearest Snacks: At the grill/convenience store at the eastern edge of Tuolumne Meadows. In addition, the Glen Aulin High Sierra Camp at trail's end may sometimes have extra openings for dinner or breakfast or be willing to sell you a brown-bag lunch, though none of these will be practical unless you're spending the night in the area; you can make inquiries when you arrive. (The High Sierra Camps reservations page doesn't appear to allow you to reserve meals ahead of time if you're not a guest at one of the camps.) Potable water is available at the High Sierra Camp. Getting There: The Glen Aulin trail departs from Tuolumne Meadows, which is along Tioga Road near Yosemite's eastern entrance. If you're approaching from the the east, you'll find Tuolumne Meadows just under 8 miles (13 km) west of the Tioga entrance. If you're coming from Yosemite Valley, follow highway 120 for 10 miles (16.8 km) up out of the valley to the Crane Flat intersection with Tioga Road, then take the Tioga Road 38 miles (61 km) east to reach the meadows. Parking: There are a couple different ways to reach the trailhead where the Glen Aulin trail departs from Tuolumne Meadows. If you're taking the first route (see the light blue trail on the satellite view), you'll have to park along the road. If you're taking the second route to the trailhead (the light gray trail on the satellite view), you have more options. You can park at the Dog Lake/Lembert Dome trailhead lot if you're doing the entire hike in one day (you can't park overnight here). You can also park along the unpaved road that leads from the trailhead lot to the stables, provided you avoid the areas marked as no parking. If the dirt road is full, which I've seen before, you'll have to find a spot along Tioga Road. Don't forget to pack: Your most bodacious swimming attire, if you're hiking to Glen Aulin on a hot day in mid- to late-summer. The pool below White Cascade (a portion of it is visible in the photo above) is an overheated hiker's nirvana, and people also swim in the pool below Tuolumne Falls, though more caution is in order there since it looks like there's a spot on the far side of the river where a swimmer could get dragged under the rocks. Check in at the High Sierra Camp to see if the river's safe for swimming - it might not be early in the year when the river is raging, though you'll be compensated with more spectacular waterfall views if that's the case. Flip-flops or sandals will come in handy for wading over the rocky portions of the riverbed. Where Should I Start? The Glen Aulin trail officially branches away from Tuolumne Meadows just behind Parsons Lodge and the Soda Springs, which you'll find a little ways east of the visitor center. You can start at the trailhead that cuts across the meadow here, or park at the Dog Lake/Lembert Dome trailhead and walk from the eastern edge of the meadow to the Glen Aulin departure point. The routes are about the same length, and both allow you to warm up with a stroll through Tuolumne Meadows. It might be easier to find parking at the Dog Lake/Lembert Dome trailhead. 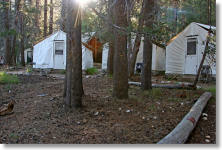 Note that the lot here is for day-use parking only - if you're spending the night in the woods, you'll need to park along Tioga Road or along the gravel road that goes from the trailhead to the stables. Checking out the satellite view might help you grok your options. Trail Notes: The first half, roughly, of the trail is flat and easy, highlighted by a big, gorgeous, and apparently unnamed meadow along the banks of the Tuolumne about three miles in. Soon after that, the trail gets rockier and begins to descend beside a series of cascades, terminating at trail's end at Glen Aulin. Walking sticks and proper hiking boots will be helpful for the rocky sections, and you probably won't regret packing sunscreen or mosquito repellent, either. Forks in the Trail: There are a couple ways to get to the place where the Glen Aulin trail departs Tuolumne Meadows; see the Where Should I Start? paragraph just above for details. Once you're on the Glen Aulin trail proper, you'll pass a handful of forks in the trail, all well marked. The first is a right turn that will return you to the Tuolumne Meadows stables; stay to the left here. The second right fork will take you to Young Lakes; again, stay left. The third fork occurs just before you reach the turnaround point at Glen Aulin. The left fork will take you to McGee Lake (not a bad detour if you've got time - it's only 0.8 miles/1.3 km away), May Lake, and/or Tenaya Lake. Take the right fork here. And you'll find another intersection right at Glen Aulin. Going straight will take you to Canada (you're on the Pacific Crest Trail, remember); going left will take you downstream to California, Le Conte, and Waterwheel Falls; and turning right and crossing the bridge will take you to the High Sierra Camp and the riverbank beside the White Cascade pool, where the photo at the top of this page was taken. Further Trail Notes For the Cardiovascularly Gifted: If you're camping here or you're a steroid-popping superhiker who can knock off 20 or 30 miles in a day, consider heading farther downstream from Glen Aulin. You'll immediately descend past some picturesque red-rock cascades to a beach and a mile and a half (2.5 km) of languid water stretching to California Falls. If you still have time available, you can reach Le Conte Falls a mile (1.5 km) beyond California Falls, and Waterwheel Falls another mile beyond that. 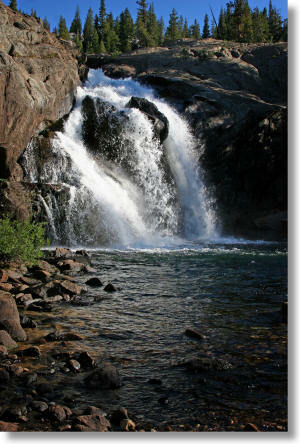 Visiting all three falls will stretch your hike to 20 miles (36 km) in all. The Glen Aulin High Sierra Camp: Are we human beings or Hiltons? Was man meant to carry a tent, sleeping bag, and kitchen on his back, and to have posture resembling a flexi-straw after he unshoulders his pack? If your answers to these questions are (a) homo sapiens; and (b) no; then Yosemite's High Sierra Camps are your kind of places. They're basically hike-in hotels. For $161 per night, you get to sleep in a tent cabin (a tent tall enough to walk upright in, with concrete floors, canvas walls, single-person cots, and genuine mattresses), and have surprisingly yummy dinners and breakfasts cooked for you. It's the chiropractor-free way to hike. There are seven High Sierra Camps in Yosemite, and the one at Glen Aulin is arguably the crown jewel. 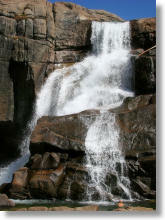 It's right at the base of White Cascade and the seductive pool below it. Remember the photo at the top of the page? The Glen Aulin camp is nestled in the trees to the immediate left of that river bank, not 50 meters away. It's a place that inspires amiable feelings and relaxed bonhomie - at my last visit, a group of two dozen worldly and largely unacquainted adults was readily persuaded to sing campfire songs together, a feat of uninhibition that I defy you to replicate at any bar anywhere. A few miscellaneous Glen Aulin High Sierra Camp notes: There are four cots per cabin. If your party isn't either 4 or 8 people, you'll end up sharing your tent with strangers. Blankets, pillows, pillowcases, and hand towels are provided, but you need to bring your own sheet(s). Dinner and breakfast are included in the basic price; for an extra $15.75, you can order a sack lunch to carry away the next day. There's potable water available at the camp, so you don't need to pack two days' worth of hydration.